Considered to be a stress injury, shin splint pain is a form of generalised pain in the front of the lower leg. Repeated jarring of the muscles, joints and bones results in a cumulative pain in the tibia – shin bone. Knowing how to reduce pain, when it strikes, will enable you to return to activity and minimise the risk of re-injury. Muscle trauma caused by excessive training or running is the main reason why pain is experienced in the front of the leg or the back inside of the lower leg. 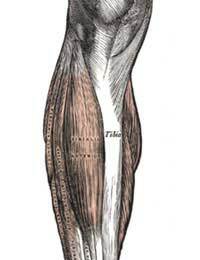 Repeated exertion causes the muscles in the leg to swell and increases pressure on the fascia covering the muscles. This causes acute pain, and in some cases the pressure can result in stress fractures. Beginner runners are most at risk of developing shin splint pain because they are not used to the high level of impact excessive running creates. Pressure and increased stress is also put on the shin bone whenever a runner pounds hard surfaces or wears inadequately cushioned and supportive footwear. Other causes of shin splints may include training excessively, a muscle imbalance between the posterior and anterior leg, running on hard or slanted surfaces and insufficient warm-up. Shin splint symptoms can range from a tightening in the calf muscles, which makes them inflexible, to acute pressure and pain that increases with movement. An aching pain may also linger after exercise and activity has stopped. Muscle pain and tenderness is generally located in the front – inside – of the lower leg, but will increase with running, climbing and jumping. There are a number of preventive measures you can take to reduce the risk of experiencing shin splints. Warming up properly before you begin training or exercise of any kind is highly recommended. Adding an exercise regime that also focuses on stretching and lengthening the muscles, in the lower leg and ankles, is also a good idea. Making sure you do not considerably increase the intensity of your workout too much too quickly will also keep shin splint pain at bay. It is also important to wear supportive, cushioned footwear that is suitable for your chosen sports activity. If you have an imbalance in the way you walk wearing customised arch supports and heel wedges may also be beneficial. If you have shin splints you should follow the RICE rules to reduce pain: Rest, Ice, Compress and Elevate. Rest the injured muscles by taking a break from your training regime. This should be no less than 7 days. To immediately reduce swelling to the area apply ice. After swelling has reduced compress the muscle with an elasticated bandage. Finally elevate the injured leg. You may also take an anti-inflammatory drug - to help ease tenderness and pain - that has been prescribed by your doctor. Once pain has decreased gentle exercise is recommended. Swimming provides both exercise and support to the injured leg so is worth trying. If you experience any pain on walking however, it is best to rest again until pain subsides. Do not continue exercising until you have been pain-free for at least two days.